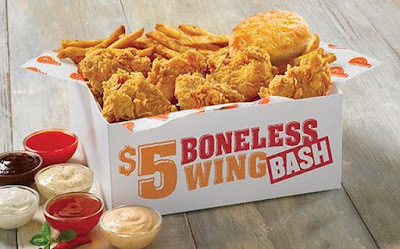 Popeyes' latest special is the new, limited-time $5 Boneless Wing Bash combo. The new meal features six Boneless Wings (AKA fried boneless chicken breast pieces), a choice of a side, a buttermilk biscuit and a choice of dipping sauce for $5. The $5 Boneless Wing Bash can be found at participating Popeyes restaurants through July 31, 2016, while supplies last.